The Mazda MX-5 Miata, shown, will shares components with the new Fiat Spider 124. The new Mazda MX-5 Miata will start at $25,735. That’s a price bump of $1,125 over the outgoing 2014 model. Prices include $820 shipping. Mazda has completely rebuilt the Miata, shaving more than 150 pounds, and developing an all-new chassis and a lightweight suspension. Jalopnik.com reported the price was first announced on “Live With Kelly And Michael” this morning. The Miata will spawn a Fiat Spider version, and could see more competition if Mini builds the Superleggera two-seat roadster. 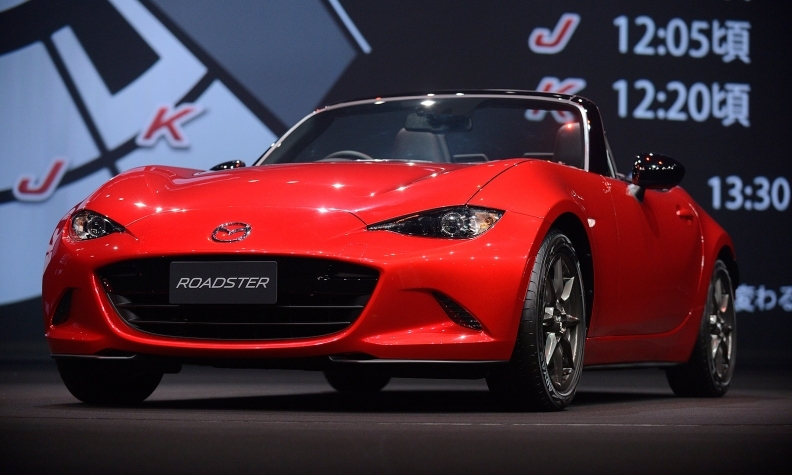 The fourth-generation MX-5 Miata is scheduled to arrive at dealers this summer. Mazda plans to sell the Miata in three trim levels: Sport, Club and Grand Touring. Compared to the Sport trim, the Club trim has more aggressive styling and performance upgrades, while the top-of-the-line Grand Touring trim adds creature comforts. Mazda has not revealed pricing for the Club and Grand Touring trim levels. U.S. customers may struggle to find a Miata anywhere near the entry-level sticker price at launch. Demand often exceeds supply at launch for cult favorites such as the Miata, prompting automakers to fill their first shipments with richer, top-of-the-line cars. Later, once supply has caught up with demand, they sell cheaper base models in greater numbers.